Designed for child learning to brush. May have full set of baby teeth. Unique cushioned head is designed to help protect tender gums. Power tip bristles are designed to help clean hard to reach back teeth. Narrow Head provides easy access for small mouths. 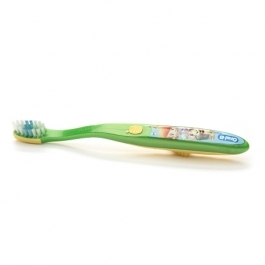 Easy to handle to help child learn to brush.